Join PULSE, our young professionals volunteer group, for individual and group volunteer opportunities. Raising awareness—and funds—at a PULSE-sponsored art show featuring original work by artists from The Arc. PULSE organizes fundraising events like happy-hours, art shows and bowling nights, plus quarterly client outings.  PULSE’s work is vital to raising awareness and increasing funds for our client services and offers a unique, fun opportunity to support The Arc’s mission while providing members with the opportunity to meet others with similar interests and develop professionally.